"Today was one of those days that I will remember for the rest of my life. 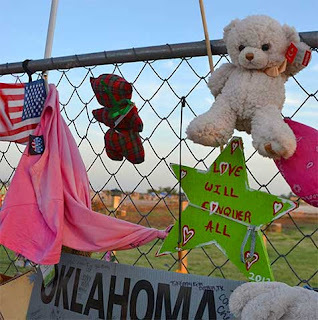 Today Sam (her daughter) and I flew to Oklahoma City, went to the Town Hall, starting spreading out some of the 400 donated quilts, and then met the people of Moore, Oklahoma who lost their homes and loved ones. Then we went on a tour of the tornado's devastation in the town, including the Plaza Towers Elementary School where 7 children died. I met 2 mothers who had lost a child, and lost their home. Then we went to a nearby hotel where so many homeless families are waiting endlessly for a place to call home. Everywhere we went, we personally gave your handmade donated quilts to those who had suffered a grave loss. We also gave a quilt to a young woman who was a first responder, who is still recovering from what she experienced. We gave a quilt to the first grade teacher who had her kids put all the desks in the corner, and then they played a game crouching under the desks, singing as loud as they could as the tornado screamed towards their school. When I hugged the 2 mothers who had lost a child, and let them pick out a quilt, I told them that with these quilts comes the love and comfort of 400 quilters who sent us these quilts as soon as they heard we were doing a quilt relief project for Oklahoma. One woman repeated over and over again - "You have to tell all these quilters thank you for being so generous - for thinking of us and sending these beautiful quilts!" There were many tears to go along with the hugs. ...and this was only for a few hours this afternoon. Tomorrow we'll be at the Moore City Hall from 9 am to 5 pm, meeting families and hugging every person who receives a quilt made by all of you wonderful quilters. The outpouring of love from so many of you, is palpable as we spread out all the colorful quilts. I will do my best to transfer this love and caring to every person I meet tomorrow, who has suffered a great loss. Many thanks to Kathy Price and her co-pilot Karen who drove the truck full of quilts down from Ohio. My thanks also to EE Schenck and Patty Reed Designs, for the 400 sturdy pink "Hope" tote bags that are being matched up with each donated quilt. Most of all, my humble thanks to all of you who rushed to send your comfort quilts for the people of Moore, Oklahoma. Your love and caring is an amazing gift of selfless generosity for these families who have lost so much. Best wishes and Happy sewing,"
All images and text are © copyright East Bay Heritage Quilt Guild or by individual Guild members or speakers.